This young boy was all smiles during his daylong call of duty. 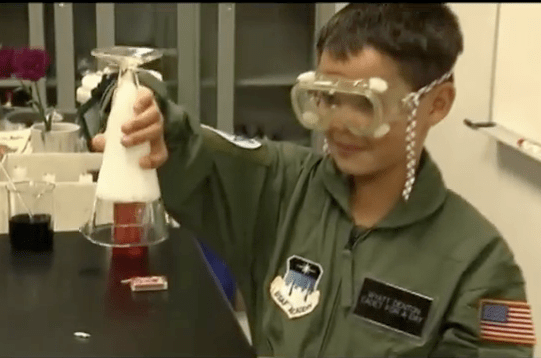 Eleven-year-old Wyatt Denton was given the opportunity to experience a day in the life of an Air Force cadet at the Air Force Academy, Colo., on Sept. 28, CBS/KKTV reported. Wyatt was diagnosed a few years ago with lymphoma and since he was little, he’s always shown interest in being in the Air Force. Through the Make-A-Wish Foundation, Wyatt’s dream came true. Wyatt’s older brother, Ryan, said Wyatt didn’t know about the Air Force until he joined. “On his list of things that he liked to do, his brother is in the Air Force, and he is very interested in the Air Force so it was one of the key things that led us to pick him to be a cadet for a day,” his mother said in an interview with CBS/KKTV. Wyatt also got to experience a magic chemistry show and a chance to fly in the flight simulators. Even after a few simulations, Wyatt was still willing to push on. “I want to go up again,” he said. He also got to tailgate with his squadron before the Air Force Falcons played Colorado State University last Saturday. Wyatt’s lymphoma is currently in remission, and he is on his way to becoming cancer-free. Hi I’m Wyatt’s older brother. Just a little correction he never knew about the air force till I joined. Just to let you know!